Repairs in the house would be incomplete without a viewFitting of such interior element as doors. They shield living spaces from external negative factors contribute to heat and sound insulation, bring warmth and comfort. Ordinary at first glance, they differ in material, shape, color, design, and have many kinds of classifications. Despite their differences, all the doors require a specific knowledge and skills for their installation. This is a very laborious and precise work of jewelry for a team of two people. Despite the complexity of the work, installation of doors with their hands quite capable of anyone who is skillful with tools. The main thing to do everything slowly, steadily, without haste, keeping doors installation rules. Measurements option, the acquisition of doors. Preparation of the opening for installation of the new door. Installing hinges and the lock on the door leaf. Fixing the door frame in the doorway. A compound leaf with a box. possible milling machine, circular saw. 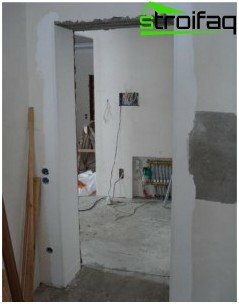 Before installing the door, you shouldto prepare the installation site. If you have an old door, then dismantle it. To do this, using a crowbar, avoiding strong and sharp movements, first remove frames. Gently lifts the hinge and take off with the old door leaf. 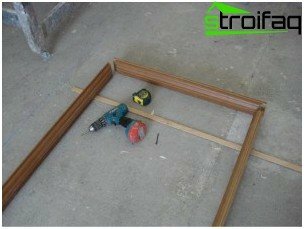 With the help of the same crowbar dismantle the door frame, in order to facilitate the process to file box in several places with a hacksaw. Quite often in the homes of the door frame was cemented. And in order to remove it, will have to break a hammer cement. 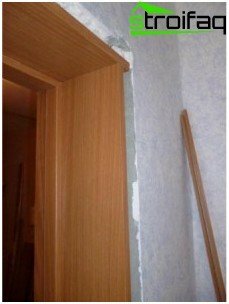 To facilitate the installation of the door slopes canalign and poshtukaturit. At the completion of the cleanse doorway of debris. 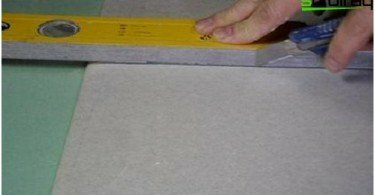 If the door has never been used, then you can immediately start its measurements. To acquire the necessary doors required dimensions in height and width, as well as Sizes slopes doorway. 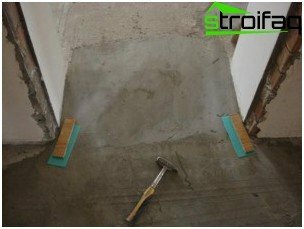 Since in most cases the doorway has rough edges, it is necessary to remove the dimensions in several locations and choose the smallest size. Important! When are the measures taken, it should be taken into account the gap between the door frame and the door opening. It should be 10-15 mm. 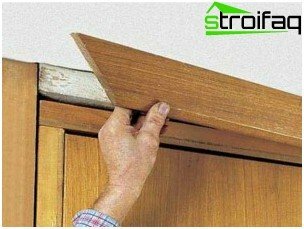 Installation of doors is recommended to do after installing the floor, if they do not exist, the size should be to lay the height of the flooring and the gap between the floor and the door. For a clearer measure can be put in the doorway of the floor covering. It is necessary to know the exact level of the floor, it determines the free running of the door. The gap between the door and the floor is usually 10 mm. Now that the old doors removed, withdrawnsizes and slopes leveled and finished to putty, doors can be ordered. Normally, doors are of standard dimensions, but can make an individual order according to the size of the doorway, if necessary. To select the right door, you need to know their type and purpose. For installation in the building should pay attention to the input, interior and, if appropriate, on kitchen doors. Choosing well by the process of opening. The most popular option - a hinged door. They are made by the same door about technology - it's piping and internal padding. 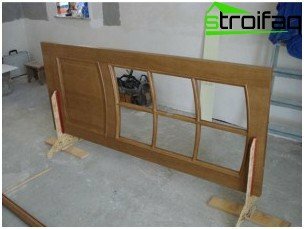 The power structure or skeleton of the door where the lock is inserted and fastened loop sheathed with chipboard, MDF or other material, and the interior space is filled. There are several designs of doors - Solid paneled and smooth. 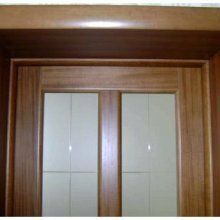 Smooth doorsThey are the same - Panel-mounted, can be made withthe outer layer of MDF and hardboard, sometimes these doors plastic sheathe. They are usually color, trim veneer or laminated. 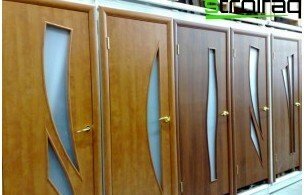 The price of such doors fluctuates depending on the materials and method of plating. The most practical and affordable doors are trimmed with a laminate. Doors covered with paint, can be both cheap and expensive. It depends on the type of material and method of painting. The most expensive doors are lined with natural veneer. paneled doors They are distinguished by their open design and the presence ofdrawings, patterned carving and stained glass windows. Such doors can be filled with glass, carved panels and other materials. They are made from a single array of fine wood or composite materials. Prices framed doors depend on the type of materials. Cheap and accessible are made from soft woods, as well as composite materials (MDF, HDF). The doors of the array made of precious wood. This affects primarily on their cost and weight, they are very high. The doors are covered with paints and a variety of impregnation, thus they are well protected against damage by insects, fungi and mold. Choosing the right doors and getting them to begin the phased installation of doors. After the purchase of unpack the door leaf,frames, door frame, transoms, accessories. Carefully check all for cracks, chips or other damage. Until that moment, until the embedded lock loop or other door hardware, door can be returned to the manufacturer. Before collecting the door frame should be marked andchoose a cutter or chisel attaching hinges and the lock on the door leaf and a vertical rack. To do this, the door leaf is mounted vertically on a wide face in special supports. In order not to damage the fabric, the inner side supports upholstered in fabric. We put the castle and a pencil outline the place of its installation. To make it convenient to use a lock, set it to a height of 900 mm from the floor. To install loops Measure out 200 mm from the upper and lower edge of the door. We put a loop and outline the space for milling. With the help of a manual cutter or chisel choose unnecessary so that the hinges and the lock lay flush. We put them back and zasverlivaem drill holes for screws. Finally, the upright are putting todoor leaf so as to leave a gap of 2.3 mm between the horizontal bar of the door frame and door leaf. Note the place of fastening of loops, and a lock tab and select the excess using a milling machine or a chisel. We put a loop and zasverlivaem holes for screws. Important! Area under lock and loops after sample cutter or chisel should be treated with varnish. So uncomplicated way the tree will be protected from the effect of moisture. It should be remembered that the input and the heavy doors are mounted on three hinges, and the interior will be enough for the two loops. When the space under lock and loops selected cutter, you are ready to install them. With loops, things are simple. They only need to fasten to the door leaf. Installing the lock on the other hand, require someefforts. To the castle became well it is applied to the side of the door and a stenciled outline holes for handles, valves and fittings. With the help of the cutter or chisel, select the desired depth location for the castle. Then we put it into place and fasten. Important! When you select a castle should be taken into account the width of the bar doors Stoev. 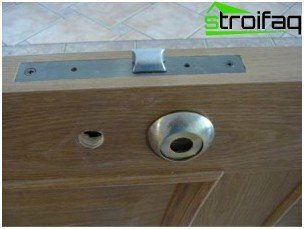 The depth of the hole for the lock should not exceed 1/3 of the width, otherwise avoid deformation of the door leaf. Getting to the collection of the door frame, measure the height uprights and cut them using the miter box. The horizontal rails are made to the size of the door leaf. Since the collection boxes requires a lot of freespace, the collection process itself is carried out on the floor. To avoid accidentally damaging the door frame on the floor under the desk laid two or three wooden slats on the entire length of the door leaf. We apply the horizontal bar to the racks. Junctions can slightly rattle hammer for a better connection, and use the screwdriver fix the box by screwing screws in the corner connections. Important! There are doors to a ready assembled door frame. Installation of such doors is very simple. In this case, the door is fitted in a box door and secured therein. If the width of the doors would be severalcentimeters less than the slope of the door, set the transoms. You can do without installing them, but then have to completely make the slopes, and they eventually appear chips and dirt. The installation transoms in such cases, the best way out. As used transoms strips of the same color as the door, the thickness from 8 to 12 mm. In the fixed state, they form a small portal, with the edges coincident with the edges of the walls. Install transoms made as follows. 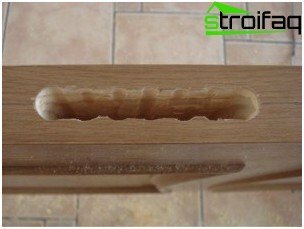 Using a chisel or a milling doorframe quarter selected 10x10 mm or 8x8 mm, depending on the thickness of the splines transoms. We are doing it all over the outer contour of the door frame. Clipped box height vertical transoms rails, as well as a horizontal bar transoms. Install the door frame in place and fix it, then set in a clipped quarter transoms bar. Sami strap is attached to the slope with dowels and screws. After assembly of the door frame, proceed to its installation in the doorway. We set up a box into the opening and fix it withwedges, 2-3 on each wedge 2 and a rack on the bar. Aligns the door frame vertically and horizontally. Adjust the incline can be easy blows on wedges. Now it is possible to fix the box. To do this, drill or hammer drill holes in the rack and the wall. It remains to put the dowels and screws to fasten the box. Important! The wedges are best made from wood of the same density as the door frame. After installing the boxes begin to hangingdoor. The first fasten to loop previously prepared site. For this purpose usually use the so-called card (plate) split hinges with removable core or embedded in the hinge pin. There are one-piece hinges, but they are used less frequently. 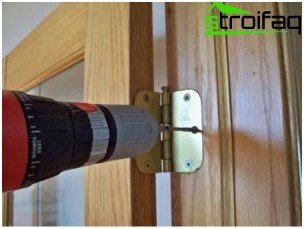 In the case of the hinge rod embedded in the door leaf can be installed or removed only by lifting it gently on a small height of the rod. If the door box design does not allow lifts the door, used one-piece hinge or hinges with removable pin. To set one-piece hinge simply fix them on the box, and then bolted to the door leaf. 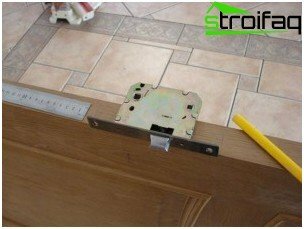 To install or remove the door leaf from its hinges to remove the rod, the rod must be removed from the hinge, and then plug it back in. Now that hinged loops can be placeddoor leaf in place. Doing it alone is best when one person holds the door in the air, and the second establishes the one-piece hinges with screws or sends them to the case with collapsible hinges. Important! When choosing the loop should pay attention to which way the door will open. 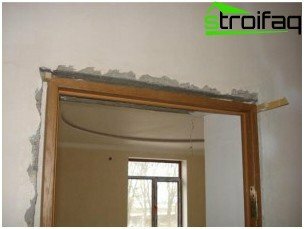 The gap between the door opening and fill the boxmounting foam, than increase the heat and sound insulation of the door opening. This material is used to fill all the little cracks and crevices. Foam is easy to work and easy to apply on any surface, and because of its astringent properties of the design will be stronger. Before filling the gap between the doorway anddoor frame should be protected from the door frame accidentally fell on her foam. To protect its box paste over with film or masking tape. If, however, the foam hit the door frame, the fresh foam can be cleaned with any alcohol-based solution or solvent. But the hardened foam can only be removed by mechanical means, which is fraught with scratches and scuffs. 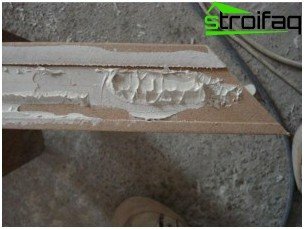 Polyurethane foam has the property to increase inamounts of 50% to 250%, which may result in deformation of the door frame. To avoid this, set the spacer between the uprights or thick cardboard is placed between the already established and tightly closed door leaf and door frame. Before you start filling foam tank it should be carefully shake for a minute. 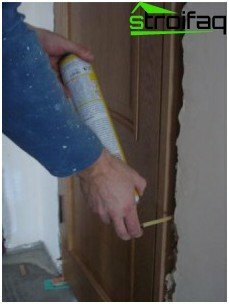 For better adhesion to the foam opening surface and the outer side of the door frame can be slightly moistened with water. The main thing is not to overdo it, otherwise the effect will be exactly the opposite. 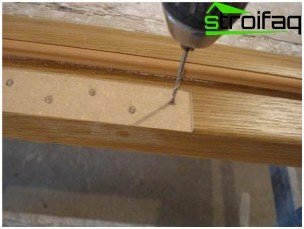 For reinsurance of deformations and distortionsdoorframe mounting foam is best applied in two stages. In the first set the foam is applied to a dot. Dove foam harden, after 1-3 hours it is possible to fill the remaining void. Excess foam cut away after its complete solidification. Important! In the case where the gap between the opening and the door frame is too narrow, tube foam sprayer can be slightly flattened, it will be more convenient, and most importantly, qualitative fill all voids. If the gap between the doorway and a box of large, 8-9 cm or more, then the space lay a suitable material (wood, plasterboard, etc.) and only then fill the foam. The vertical gap must be filled with foam,starting from the bottom and gradually moving up. Thus, the foam will create a support itself. In the case of transoms they should be additionally set spacer to avoid deformation. At the final stage of installation, the door installation casings. First casing clipped height, thenthe upper edge of the vertical casings are cut at an angle of 45 degrees. Such trimming is done at 45 degrees to the horizontal casing at both ends. For these operations, we use the miter box. Fix the casing is possible by means of small nails or universal mounting adhesive. Hammer nails should be at 300 - 400 mm,starting from the top corner. When using glue, it is applied to the reverse side and on the casing wall. Firmly pressed casing, if necessary fasten it clamp and leave to dry completely. The climax of all the work will be the installation of door accessories - handles, valves, locks, latches and couplers, lock washers, door stops. Perform all work on the installation of doors can becomplete in one day. It all depends on the skills and abilities of the masters, as well as on the speed of drying of certain materials that are used during assembly. Rules and recommendations presented above, can be used for installation of metal and plastic doors. The difference will be only the necessary tools for different types of materials from which made the door.